Let’s leave this one to the supernatural, by all means, Fiz. My “knowlege” of this at all stems from my play with the DeMolay basketball team in my youth. I read the history of DeMolay there. The prophecy is accepted as a historical fact in that material. It makes a very good story,KYGB, but…in the seventies, a French adaptation of “The Accursed Kings” a series of novel Maurice Druon (which aren’t in print and go for huge prices second hand) ran in the UK with English subtitles. I watched it because I was doing a French A level at the time and because I love all history. The writer, although he wrote them as novels, took it very seriously and did a lot of research and has your version of De Molay’s words. Mine are another version. I guess it all depends on what books he’d read! I know I’d also prefer it to be supernatural! Well Fiz, it was Jacques De Molay, but what was said and who all said it are subject to conjecture. 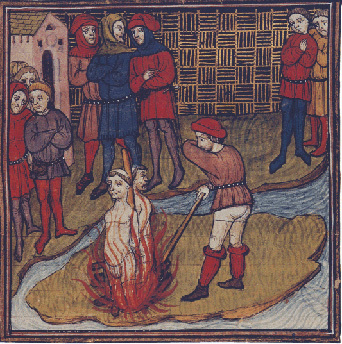 “It is said that Jacques de Molay cursed King Philip IV of France and his descendants from his execution pyre. The story of the shouted curse appears to be a combination of words by a different Templar, and those of Jacques de Molay. An eyewitness to the execution stated that Molay showed no sign of fear, and told those present that God would avenge their deaths. Another variation on this story was told by the contemporary chronicler Ferretto of Vicenza, who applied the idea to a Neapolitan Templar brought before Clement V, whom he denounced for his injustice. Some time later, as he was about to be executed, he appealed ‘from this your heinous judgement to the living and true God, who is in Heaven’, warning the pope that, within a year and a day, he and Philip IV would be obliged to answer for their crimes in God’s presence. Did JdeM utter the curse or is it a tale concocted after the deaths of the King and the Pope? I think the latter, but who knows? Which one of them , Jacques De Molay or Geoffrey de Charney cursed the Valois ” unto the thirteenth generation” ? Or is that myth too?